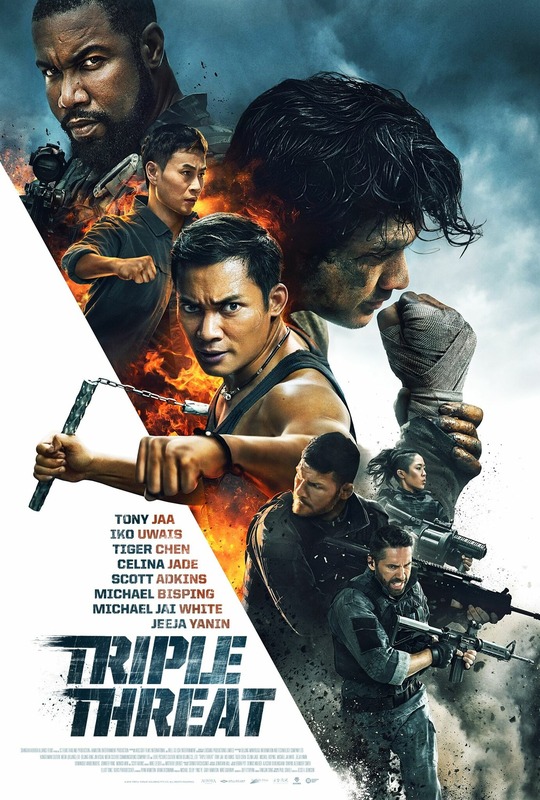 Chrichton's World: Review Triple Threat (2019): It's fun while it lasts but it could have been so much more. Review Triple Threat (2019): It's fun while it lasts but it could have been so much more. Tony Jaa, Iko Uwais, Tiger Hu Chen, Michael Jai White and Scott Adkins are all feautured in this little action flick. You would think that with all these names involved you couldn't go wrong. And to be honest the film was fun while it lasted. But I can't help but feel that it could have been so much more. Triple Threat seems to be a throwback to older Eighties films where the plot is in service of the action and where you shouldn't get too hung up about the plot and it's flaws. Because believe me there are many flaws in the incredible simple story. Basically this is a revenge story where Iko tries to outwit Scott Adkins and gang. Maybe it looked better on paper. The way it was executed though was amateurish at best. Then the sense of humour. Nothing wrong with infusing comedy and keeping things lighthearted. And while I did enjoy this it did come across as poorly timed and out of place. Many times it's apparent that the Asian actors are struggling with the English language. And let us be fair here, it's not like we are expecting them to deliver Shakesperean lines or anything. However at times it hurts the intensity of certain dramatic moments. Yes even in B movies you are required to be serious at times. But to me this is peanuts compared to the one thing that really matters. The action. Certainly adequate and decent. But that's all it is. Standard stuff for each of the actors mentioned in this article. None of the fight scenes are extraordinary or remarkable. And this surprises me a little. Surely amongst them they could have choreographed something exciting? I get the feeling that director Jesse V. Johnson was in their way of doing so. Judging purely on his previous work. Like The Debt Collector and Accident Man. The fights in those films are of the same caliber and more the brutal kind. Which is fine if it fits the story and context of that story. In Triple Threat there had to be more. I mean even the title suggests that the three amigos Iko, Tony and Tiger combined are a force to be reckoned with. Unfortunately they weren't. And that is a real shame since I was so prepared for a no holds barred fight between Tony Jaa and Scott Adkins for example. Overall the film is entertaining but in my opinion is a missed opportunity to have done something truly epic. These names together should have caused fireworks. Instead we get a "generic been there done that" action flick. Such a shame!